Maybe it's just me, but couldn't you find a "parts guy" behind the parts counter of your local Nissan dealership? Hey Rick. I contacted two dealers and allegedly they don't have parts numbers or pricing on the 19s yet. Nissan dealers will have the new 2019 parts list soon, but the lights will be on back order for a while. Unless you have $10K set aside don’t bother anyone. i'm 99.9% sure no sheet metal was changed for 8.5 gen-update. If that is the case then mounting point should(?) be the same. The bigger question is wiring, I'm sure this will not be plug and play. For me the tail-lights is where I would spend my time and money. 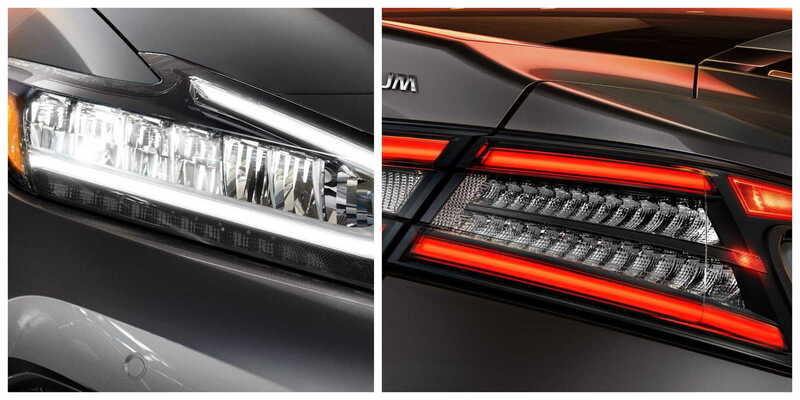 Going to all LED (as it should have been for 8th gen) is a bigger win + amber turn signals. All that’s left is building a relay box to eliminate hyper flash and to get the factory wire ends to connect to the new tails. I’m not sure if the inners are identical so I priced them as well, if they are the same then you save $321.72. Call em up. I used this 2019 vin. why can't people use SEARCH? This will not work unless you have $8-10k for the wiring and other conversion. And then will look like crap. Care to show me a thread that discusses and solves my question? It’s a brake led and a turn led. And it’s 12 volts. This is some beginner level electronics. Also the exterior will line up perfectly as there are no sheet metal changes so it won’t look like crap. Thanks for your common sense though. Also for those that say just trade up, I paid $25k for my 16 platinum with 18k miles on it in July. Trade now is probably $21. 2019 Maxima Platinum is $41k. So yeah. Nissan is not going to make it easy to "just line up" new parts with an old design. And - based on my experience with other cars - people who have attempted this (and done wiring harness changes) have started fires. Not saying that's the case here, but it could be. A cheaper solution would be to gut the 2015-2018 module and make it as similar as you can. I still don't get why people want to do this. They're fugging taillights. CarPlay would be a far greater benefit for me (2016 owner). How about being satisfied with what you have and don't envy others. I think the design still looks great up to the 2018s. I wouldn't purchase a 2019 moving forward simply because of those ugly exhaust tips... lol. I always felt one if Nissan's signature looks were the rounded exhaust tips. Oh well. I dont see the need for negativity or the “How could you?” syndrome. It’s a car, mod away or leave it base. Up to you. Best response since I started this thread. Thank you . As I work towards my goal I’ll do a write up. And if anyone else has anything helpful to add please do. Pretty much the only thing I’m unsure of is where to get just the connectors (the male on the end of the harness going to the brake light and turn signal, and the female on the lights themselves). I have modified this car to improve it to my liking and will continue to do so. So far it’s basic, tint, led reverse, led fogs, shaved all trunk badges, but this is by far my largest endeavor in modifications. Last edited by 573dave; 12-23-2018 at 02:56 PM. 573dave can you add pics also? I’ll be adding a full write up and maybe even selling a kit to easily convert. But it may be a bit while I save the $1,000 up. It's a free country and this is an open forum and all, but I can't understand some people's fascination with mods they can't either see, or feel, when they themselves are driving the car ... My 2016 Toyota Camry LE, the one I traded in for my 18 Max, had LED backup lights and license plate lights. A basic, barebones 2016 Camry, which I bought used with about 1000 miles on it, LED lights were put in by previous owner. It just perplexed the crap out of me. Then when one of the license plate LED lights went out the price was ridiculous for an in-kind replacement, so I ordered two regular light bulbs. LEDs are cleaner, brighter, safer, longer lasting, literally every single advantage over incandescent minus the price. Lots of car mods you can’t see from the driver seat. I see my tail lights regularly though. Just like I walk by my front bumper. Also when I’m showing off that 300 hp, that guy is seeing my tail lights. Not true . They are plug and play. It may need a relay for the back tails. The front also work but the is a gap between the bumper and headlights. They are plug and play. They fit . For carplay and Android auto just change your head unit .It's discussed here in another thread . I have updated reverse lights to LED. Not seeing a huge difference but whatever. I am starting to see 2019 Maxima headlights on EBAY. The tailights look to be an easy swap though there might be a need to add resistors to the tailights if they aren't already there. Also might have to replace the T/S flasher. $699 PLUS $702 in shipping? This is a scam. Or these are stolen. Look up @ menacingmaximas on instagram, complete rear swap. only issue was hyper flash and a $40 resistor fixed that issue. thread cleaned up. Stay civil guys or I'll blow the dust off my ban hammer.